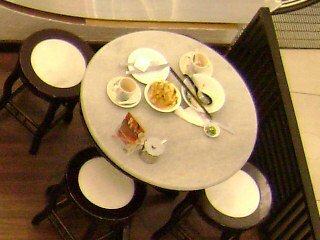 Kopi tiam is one of Malaysian ways of presenting food at a typical Chinese coffee shop. The words came from the Hokkien dialect, it means "coffee shop". It is a shop with informal setting, mostly for breakfast and also teatime. Classic meals which are served include toasted roti benggali (Indian white bread) served with homemade kaya (a rich jam made with coconut milk and eggs), milky ginger tea and also curry laksa. Classic marble-topped furniture at a kopi tiam. Special blend of local coffee is available and one of the ways to prepare it is called "white coffee". Other things you can eat here are kuih pau (steamed buns with sweet or savory fillings) and half-boiled eggs. The furniture consists of round marble-topped dining tables with stools. The inexpensive ceramic teacups used for serving coffee and tea came from China in green patterns. It is a cozy, sometimes noisy atmosphere with the chatter of the patrons and the clinking and banging of glassware and pots and pans. As always, with the emergence and increasing popularity of branded coffee houses, some of the shops are revamped with trendy contemporary l ooks and also franchised. Expect to pay more than average for a dining experience at one of these outlets. Lucky you, now you can bring these classic food to your own home by following my recipes. If you are feeling ambitious, try to make your own homemade kaya, milky ginger tea, a nyonya snack and curry laksa to serve to your family for a relaxing Sunday afternoon treat. Roasted Coffee - Buy fresh roasted coffee from Golden Roast Coffee at competitive price. Genuine Arabica Bean coffees are sold and these coffees are freshly roasted when your order comes in. Ginger Honey Drink is my favorite as it is refreshing, delicious as well as nutritious.